On August 17th, a family outing turned into a heroic rescue when 12-year-old Jeffrey McPherson realized that a ‘lump’ floating at sea was actually a turtle in distress. Jeffrey and his family were enjoying a drive up north just before Rocky Point on northern Ambergris Caye when they saw the floating mass. Jeffrey told his stepfather Ezekiel Larios that he was sure he saw a flipper and worried that it was a large animal in despair. They both decided to take a closer look and realized that it was a turtle tangled in a web of ropes. Jeffrey’s mother Debbie shared the incredible news on her social media page, sharing how thankful the family was that they chose to look closer. 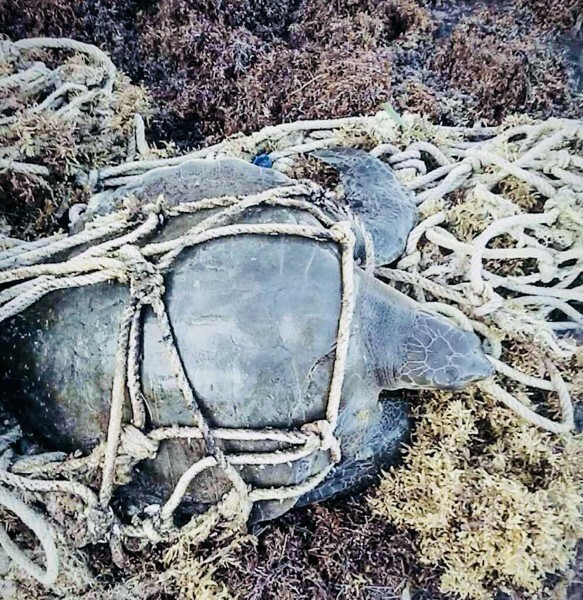 She says that the turtle was tired, its shell cracked, but it was still feisty, fighting his rescuers for a little bit while the ropes were removed from around it. Thankfully, once liberated, the turtle swam quickly away to freedom. “The ropes alone weighed about 12 – 15 pounds,” said Debbie. “According to Jeffrey, turtles can only stay underwater for about 25 minutes or so at a time before they have to come back for air.” The turtle’s fate could have been far worse had the ropes gotten tangled and held the turtle down, as the stress causes turtles to use up stored oxygen and drown within minutes quickly. Without stress and with minimal activity, sea turtles can remain underwater for several hours. The turtle was found near a favorite fishing spot for guides, as the family says they run into them all the time around there. According to Linda Searle of ECOMAR Belize, the turtle is the second confirmed Olive Ridley sea turtle in Belize. The first Olive Ridley was found entangled in discarded fishing gear near Hol Chan in 2011. 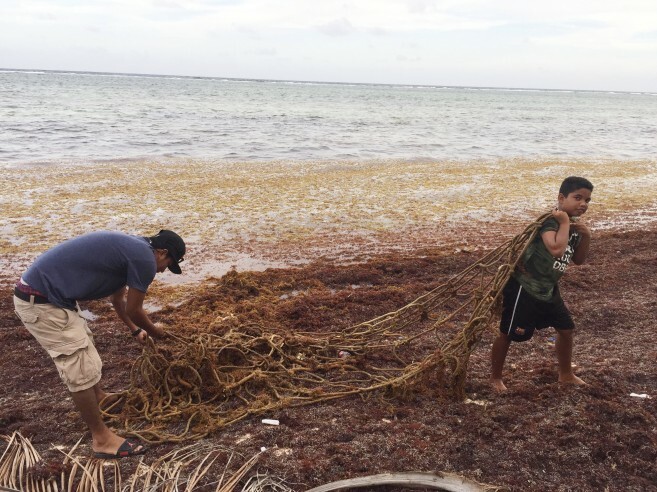 When asked how he felt having rescued such a rare animal, Jeffrey said, “I feel awesome for saving a rare sea turtle!” He joined his stepfather in removing the rope from the water to ensure that no other marine animal gets tangled in that net again. A few days later, on Monday, August 20th, members of the Hol Chan Marine Reserve (HCMR) spotted another Olive Ridley Turtle north of Ambergris Caye. According to Kirah Forman, biologist at HCMR the turtle was tangled with what appeared to be a net made out of ropes. She stated that these turtles are not commonly seen around Ambergris Caye or Belize and also weighed in on the possible reasons why they ended up around the island. Forman speculated that perhaps the turtle became tangled in the ropes somewhere else and drifted with the currents to Ambergris Caye. “They did not come here wishfully, but because they were tangled with these ropes/nets they were brought down to our shores by currents,” said Forman. She added that as soon as the turtle is released, they swim back to where they came from, which is more likely around the Gulf of Mexico. Olive Ridley’s are currently the most abundant of all sea turtles, but their vulnerable status comes from the fact that they nest in a very small number of places, and therefore any disturbance to even one nest beach could have huge repercussions on the entire population. Their shell is an olive green hue, hence their name. The largest are observed on the Pacific coast of Mexico. The Olive Ridley is found in the tropical regions of the Pacific, Atlantic, and Indian Oceans. In the Pacific, it prefers beaches of Mexico south to Colombia.